The indictment of the Holy Land Foundation for Relief and Development (hereafter “HLF”) after the 9/11/2001 attacks on the United States was the result of a 15 year FBI investigation. At the time it was indicted, HLF was the largest Islamic charity in America, and it was a terrorist organization. 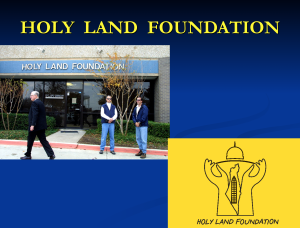 Specifically, the Holy Land Foundation was a Hamas organization. Hamas is a designated Foreign Terrorist Organization and an inherent part of the Muslim Brotherhood. In November 2008, the HLF and its leaders were convicted in the Northern District of Texas (Dallas) of 108 separate counts for including funneling millions of dollars to Hamas terrorists and Hamas terrorist organizations overseas and money laundering. The leaders of HLF received lengthy prison sentences. The evidence in the US v HLF trial revealed an Islamic Movement exists in the United States led by the U.S. Muslim Brotherhood. The most prominent Islamic organizations in America are Muslim Brotherhood/Hamas front groups whose stated objective is to wage “Civilization Jihad” against the United States to overthrow our government and establish an Islamic State (caliphate) under sharia (Islamic law) – the same objective as Al Qaeda and the Islamic State. The Islamic Society of North America (ISNA) is the “nucleus” for the Muslim Brotherhood’s Islamic Movement in America which directly funds the terrorist group Hamas. The Council on American Islamic Relations (CAIR) was created by the U.S. Muslim Brotherhood’s Palestine Committee (Hamas) in 1994 following a 1993 meeting in Philadelphia, Pennsylvania at which the FBI put microphones in meeting rooms, tapped phones, and conducted physical surveillance because, according to the FBI, the meeting was “a meeting…among senior leaders of Hamas, the HLFRD, and the IAP.” Omar Ahmad and Nihad Awad, founders of CAIR, were at the meeting. The Islamic Circle of North America (ICNA), Muslim Students Association (MSA), International Institute of Islamic Thought (IIIT), Fiqh Council of North America, Islamic Medical Association of North America (IMANA), and many other Islamic groups are part of the Muslim Brotherhood’s Movement. Why does this matter to us today? These organizations, and many more Muslim Brotherhood organizations, still exist in the United States today. There are approximately 330 “Islamic Societies” in the U.S. today which are subsidiaries of ISNA. There are approximately 800 MSA’s on nearly every major college/university campus in America. There are over 3200 Islamic centers/mosques in all 50 states in the U.S. the majority of which are a part of the Muslim Brotherhood’s Movement. Leaders of ISNA work with the Congress, national security staffs, State Department, receive awards from the FBI, teach at the CIA, and have been given security clearances. CAIR, ISNA, and ICNA control the Interfaith Outreach across the U.S. The vast majority of media outlets refer to CAIR as a “muslim civil rights group” instead of a “front for the terrorist group Hamas” and give them a platform for their propaganda. Businesses like Amazon work with ICNA and other jihadi organizations to produce propaganda commercials like THIS. In Dallas County (TX) NAIT owns 5 properties. In Travis County (Austin, TX) NAIT owns 9 properties. In Harris County (Houston, TX) NAIT owns 16 properties. In Tarrant County (Ft Worth, TX) NAIT owns 12 properties. Enough evidence exists today to indict ISNA, NAIT, CAIR, and many other Islamic organizations. What is the Department of Justice waiting on? 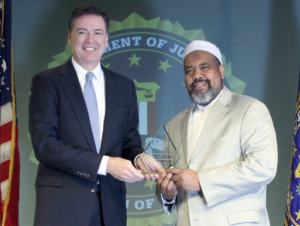 Since currently dormant and under the (contextual) control of treasonous federal sycophants allied with Muslim purchasers of American political power, any Department of Justice quest for additional criminal indictments based on the extant comprehensive frame work of actionable data uncovered by the FBI’s post 9/11 fifteen-year investigation of Islam’s multi-faceted vanguard of anarchical war* on the United States in order to gain our acquiescence to draconian enslavement — or suffer violent death at the hands of sharia-adherent killers should we refuse — is, and will remain (or so it appears) out of the question. Paradoxically then, inasmuch as said crowd of duplicitous misfits, to the delight of their sharia-adherent allies upon whom they regularly bestow accolades of affection, also comprise the so-called “shadow government” and “secret society”, both of which seek the destruction of the American presidency, unless their custody in abeyance to federal arrest warrants is achieved, and subsequent indictments and convictions thus ensue, the country in its original form as the Constitutional Republic we now know and thus love could cease to exist. Think about it, the next time you kiss your children goodnight. *Anyone wishing to acquire a personal Arabic-to-English translated (verbatim) copy of Islam’s comprehensive declaration of war on the United States I.e., in their own words, which was seized by Special Agents of the FBI from a subterranean basement in Annandale, Virginia in compliance with a federal search warrant, in 2004, may do so for a nominal handling & postage fee by contacting http://www.securefreedom.org to request: GOVERNMENT EXHIBIT 003-0085 3:04-CR-240-G U.S. v. HLF, et al. What is wrong with this country? Anyone can see that the Islam threat is very real and needs to be done away with. Are we going to sit on our hands while they do as much damage as their “religion” will allow like what is happening in Europe??? This is insane!!! tributaries of muslim organizations for every professional field.Inside the government reaching an apex during the Obama administration that reinforced a false narrative of a peaceful religion, The peaceful narrative suppressed inquiry, tapped the nail in by Islam sharia slander laws to be silent or be smeared. The prior administrations mis-identification lead to money flowing in for mosques, schools and politicians persuasive influence that held candidates hostage to win elections.Another clever move was buying shares of media,news channels, twitter, demanding compliance to hate speech laws. Actually it was setting up an islamic political structure or hidden government that would direct narratives and follow orders. The population growth enhanced with male refugees posing as refugee but just following the 1400 years preparation for an islamic land grab and they use jihad to do so it is a threat to the citizens of the U.S. and will show it’s face when they are sure we are divided.